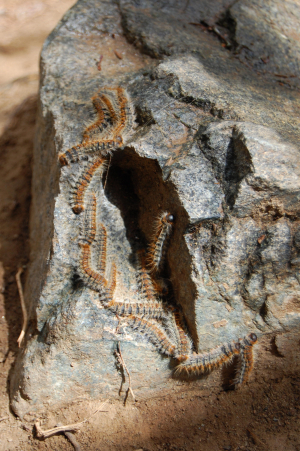 I assume these caterpillars had just emerged from a nest made in the nook of the rock. By the time I returned (climbed to see the Caledonian Falls) they had formed a chain, presumably for a 'safety in numbers' reason/to look like a bigger animal. I would like someone to confirm/correct me, and if they can identify them too that would be great.